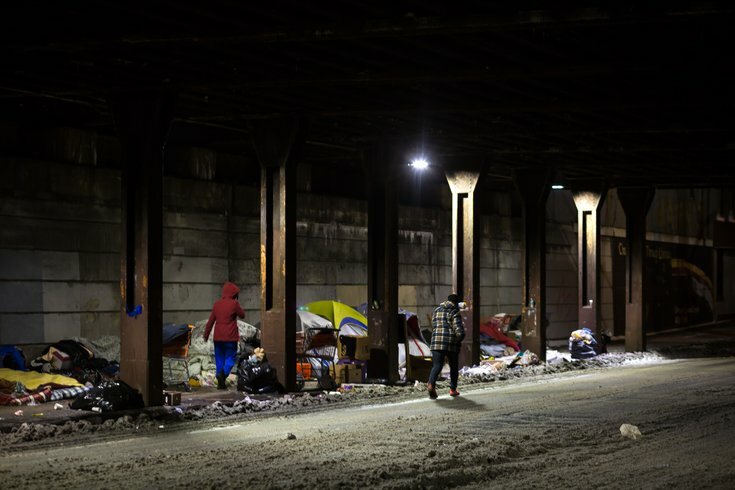 As temperatures dropped into the teens on the evening of the first major snowstorm of 2018, people huddled together in tents and on mattresses under piles of blankets lining the sidewalks of Kensington Avenue under the Conrail train tracks. Philadelphia announced Thursday that a new pilot program would close two of four large encampment areas under bridges in Kensington over the course of the next month in an effort to combat the opioid crisis. About 200 people are estimated to live inside these heroin encampments on Lehigh Avenue. “We’re giving them the opportunity to get off the street and get the help they need by addressing many of the barriers that are usually a deterrent to getting services like the lack of ID’s, lack of transportation and guaranteeing immediate access to treatment — But the clock is ticking,” Liz Hersh, the director of the Philadelphia Office of Homeless Services, said in a news release. The first step in the process is outreach, in which workers will use daily interventions to “assess individual needs and connect individuals with services, including respite and treatment,” the release outlined. A new navigation center will open 40 shelter beds, in addition to a mobile outreach and recovery van to provide medical care. According to Project HOME, in 2017 there were only about 11,500 emergency shelter beds available in Philadelphia while about 15,000 people access shelter in Philadelphia each year. Many are turned away because of the lack of capacity. Individuals will have 30 days to leave after notices are posted at each encampment, and the closures will be enforced by the 24th and 25th Philadelphia Police districts. The launch of the pilot program follows the city’s announcement that 1,217 people died from a drug overdose in 2017 — four times the number of homicides in the city.